Up until yesterday, I didn’t really get chicken waffles. But for Valentine’s Day, I decided to cave to societal pressure, and enjoy a juicy, savory, fried hunk of something over a carby, crispy something, covered in sticky sweetness. Even if it makes no sense! I mean, where is the kale? Where are the lentils? Sigh. OK.
Those thoughts plagued me as I stirred the batter and simmered the seitan, although each component was nice on its own. The waffles were perfectly crisp, and I knew they’d be able to handle the syrup without sogging up. The chicken-style seitan came out really flavorful, with a firm but tender texture. The breading on the seitan was totally delish and I couldn’t help but eat a piece straight out of the cast iron skillet. OK, maybe two pieces. For the syrup, I wanted a bit of V-tine love, and so pomegranate saves the day! Pomegranate molasses is an easy way to infuse flavor into the maple syrup. Plus, the seeds from whole pomegranates are just as romantic as you can get and they look like they’re from another planet (a very romantic planet, to be sure.) So yeah, everything looked great, but all together? I don’t know. My inner chicken and waffle skeptic still had her arms folded. I took a triangle of waffle (surely, that’s all I would need to know for sure), tucked a little slice of breaded seitan in there, and dredged it in some of the syrup. Well, needless to say, the angels sang. A marching band appeared out of nowhere. Glitter confetti flew from the ceiling. I think I caught a glimpse of Ryan Seacrest. OMG this was good. So now I totally get it. A sweet and savory combo that maybe isn’t for everyday, but for a special brunch or a Valentine’s dinner, this is where it’s at. ~If you don’t feel like dealing with all the pomegranate stuff, just use straight-up maple syrup. Maybe add a few raspberries for garnishing prettiness. ~To make the recipe less cumbersome, simmer the seitan a day ahead, and remember you have loads of downtime as it simmers. ~You can also totally make the waffles up to a week ahead. Freeze them in a plastic storage bag and simply toast when ready to eat. ~If you’re especially lazy, you can use storebought seitan. But I really really love this seitan recipe so I hope you’ll try it. Especially because then you really have control of the shape of the seitan, plus, it will just taste better! ~The homemade seitan makes double what you’ll need for this recipe, but I figure if you’re making it, why not make some extra for the week? It’s really great grilled for salads or sandwiches. Just mix the syrup and pomegranate molasses together in a measuring cup, yay! In a 2 cup measuring cup, use a fork to vigorously mix about half the milk with the cornstarch, until fully dissolved. Add the remaining milk and the vinegar and set aside. In the meantime, combine flour, baking powder, sugar and salt in a large mixing bowl. Make a well in the center. Add the milk mixture to the flour along with water, oil, and vanilla. Mix until the batter is relatively smooth. A few lumps are a-OK.
Preheat waffle iron and let the batter rest. Cook according to waffle iron directions, spraying the waffle iron liberally with oil or cooking spray between each waffle is made. Have ready a few layers of paper towels (or brown paper shopping bags) for absorbing the oil after frying. We will bread the seitan before starting the oil. This way you don’t have to worry about overheating the oil while you bread. You’ll need to fry in two batches. Slice each piece of seitan into 4 slices, on a bias, so that you have long wing looking pieces. You’ll need a big plate for breading and a wide bowl for batter. In the bowl, mix together the flour, cornstarch and water. Mix vigorously until thick and smooth. Set aside. On the plate, mix together the bread crumbs, thyme, salt and pepper. Dip each seitan slice into the the wet batter, letting the excess drip off. Transfer to the breadcrumbs bowl and use the other hand to sprinkle a handful of breadcrumbs over the seitan, to coat completely. Make sure you use one hand for the wet batter and the other for the dry batter, or you’ll end up with club hand. Set each piece aside on a big plate, then start your frying oil. Preheat a large cast iron skillet over medium heat. Once hot, pour in about 1/2 an inch of oil. Wait about a minute. Now test the oil by throwing in a pinch of breadcrumbs. It should sizzle and bubble without smoking, then you know it’s ready. If it burns or smokes quickly, lower the heat. If it just sits there doing not much of anything, raise the heat. Without overcrowding the pan, fry each piece of seitan for about 2 to 3 minutes on each side, until golden brown. Transfer to paper towels to drain the oil, and then do the next batch. I can’t wait to try this but seriously your writing just makes me laugh. You are such a good writer, when so many people try to give all sorts of descriptive words about their food which never makes me want to try it. Instead you give a story that makes me laugh and drool and want to eat everything in your picture. Thanks! I have never had this combination and wondered what it would be like. Your version looks pretty darn good! Got to say, I’m still skeptical, but now I’ll have to try…. Any tips for making the texture of the seitan better? I used your recipe once before, and while it tasted AMAZING, the texture was kind of like “brains,” which I think is the word you used to describe seitan made by a newb. I thought I did a pretty good job with the simmering though. Do you have to really flatten it or something? I’m basically dead over this. LOVE. February 13, 2014 at 4:37 pm: Lyndsay O.
I made this with your chickpea seiten from Isa Does It, and wow! One of the best dinners ever. Thanks! Ummm. Yes, please!! This looks so delicious. Ditto to Bonnie that your writing brings a smile to my face – awesome. Looks like a dream. I need to make this for Valentine’s day. Hmm, but I was going to make the Just Chocolate Cake from IDI. Would it be awful to make both and eat it all between two people? Made it today, AMAZING. Thank you! @Mae: if you end up with rubber-brain seitan, it means the temp got too hot or you boiled it too long. If you have a slow cooker, try using that to make seitan. It’s basically foolproof and yields the best results (in my experience). good luck! I was suspicious, I never had Chicken and Waffles before. I just made it and not only am I a hero to my husband, but it was really good. Where do you buy your pomegranate molasses? I’ve only seen it in Turkey. ??? Thanks. I got mine at Whole Foods, but a Mediterranean grocery would have it and I’ve even found it at a regular old supermarket. 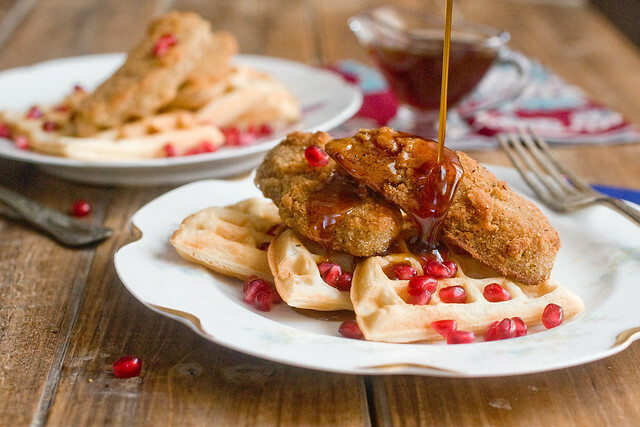 I just wanted to alert you that this post (your content) has been illegally copied on http://munspage.com/seitan-waffles-with-pomegranate-syrup/. I have had several of my posts stolen as well and dealt with them to remove it. I would highly recommend the same to stop illegal content pirating. You can reach out for their email address. Hi Isa! This recipe looks delish! Could the batter for the chicken be used for any other recipes? Thanks in advance! Whoa, Isa! This looks SO EPIC! I would totally eat this for breakfast, lunch and dinner! This was delicious! I made just the seitan and then served it on salad with honey mustard dressing. It was a perfect weekend dinner: treat-like without being difficult. I never really ate much fried chicken, but my husband did and he swears the texture of the seitan was just as good if not better. Definitely watch the heat on your broth. I kept it at a very low simmer and cooked the seitan the full 45 minutes. Hot damn, Isa. Hot damn. I’ve never understood the attraction either, but after that description, I’m just going to have to try it ! I baked my seitan after breading it and just used some maple syrup I had in the house- so not totally exact….. but it was awesome!!!! The waffle recipe was perfect and sweet and I will definitely be using it on many upcoming weekends. Next time I am determined to get the pom molasses and seeds. What a great idea! This looks so delish, I’m drooling! I know everyone’s freaking over the waffles, but the seitan looks amazing! date with impending post. Thanks one million and please continue the gratifying work. Made these today. Yeah that’s delicious seitan. These are OMG good! I mean, you wouldn’t eat like this all the time, but when you want a treat, these are so worth it! They’re not hard, though the frying is messy, and they come together in a snap. And did I mention that they’re FREAKING DELICIOUS? Because they so are. Thank you for the waffle recipe! I made them gluten free by using 1 cup of brown rice flour, 1 cup of plain gluten-free flour and 1/2 tsp xanthan gum and they turned out great! These waffles are my new favorite! Great with blueberries. Oh me, this seitan is terrific. Life changing! I made this for my wifes birthday, and she loved it. But I had a small problem with the language because I missunderstood “fry the seitan” and didn’t read the whole thing, so I deep fryed it ;) . And it was one of the best mistakes I’ve ever made!! Lets make a Cult for Isa !!!! Hey There. I ffound your blog using msn. This is a vvery well written article. I made this today, just with regular maple syrup, since I didn’t have pomegranate. I have never had chicken and waffles, so I wasn’t sure what to expect, but I know everyone always talks about them… delicious! As, usual, with your recipes, of course. My boyfriend loved it too, so this one week definitely be a keeper around here. full melt chocolates are too delicious. on regular basis to get updated from most recent reports. Would this work with a belgian waffle iron? I think this one may be outside my range but it looks so good I have to try it. This was SO GOOD!! Why did I wait until now to make it? My guy wants to eat it for every meal now though. Sigh. I dig your blog! I have been either vegan or veggie for 17 years now and always appreciate new recipes! Anyway I also wanted to share with you my blog that specializes in punk videos. It’s called ear stress and the address is http://www.ear-stress.blogspot.com. Check it out if you get a chance. Thanks for the recipe! The wife asked for waffles this morning and was able to make some vegan ones finally that tasted great. I didn’t have any cornstarch on hand so I threw in a few chia seeds and they came out fine. I want to try the seitan chickenless next!! Mine seitan didn’t come out that way. :( :( :( How do I keep the breading from coming off in the oil? you can find the best yoga mats here! Really love this site. I have been taking recipes from it for a couple of months now. It seems like you are not posting any new recipes. Are you planning on doing so or have I missed something? Please let me know. This is my new favorite thing :). This was *awesome*. The seitan was perfect (one of the most “chickeny”) and the waffles – divine. Loved the pomegranate syrup and it really complimented the thyme in the “chicken” breading. Loved this! Thank you for yet another fabulous recipe.